(CNN) -- Promosing Briton Amir Khan took a huge step towards a world title shot at lightweight after a fifth-round technical decision win over Mexican legend Marco Antonio Barrera in Manchester on Saturday. 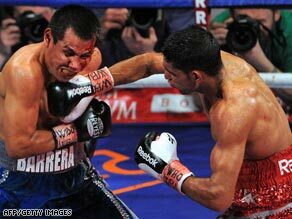 Amir Khan (right) lands another punch on Marco Antonio Barrera on his way to a points victory on Saturday. Khan, 22, comfortably out-boxed his 35-year-old opponent -- a seven-time world champion at three different weights -- before a cut suffered in the first round eventually brought the contest to a premature end, forcing the result to be decided on the judges scorecards. The 2004 Olympic silver medalist faced a major step up in class against Barrera but victory means he could be in line for a world title shot later in the year, probably against WBO champion Juan Manuel Marquez. Despite being far from home, Barrera received a rapturous reception from the British crowd while Khan was amazingly booed by some. Khan boasted a significant height and reach advantage over his naturally smaller opponent as they squared up before the opening bell. Khan began the first round measured without being negative and was firing off lightning-quick volleys. Two excellent right hands landed and Barrera also found the target occasionally without hurting his man. But Barrera had suffered a cut as he took several hard left hooks and a decent right and ended the round with a bad gash over his left eye -- close to an old wound suffered in his last fight. Concerns about the injury proved to be well-founded as blood streamed down his face in the second round. Barrera could only really see from one eye and his task was made more difficult as Khan boxed, moved and showboated in the style of a future champion. The referee interrupted the fourth round to have Barrera's cut looked at by the ringside doctor and despite the severity of the injury, the fight carried on. Again the referee paused the action in the fifth to have the cut looked at and this time, with blood literally coursing down his face, the end finally came. The cut was ruled an accidental clash so the fight went to the scorecards, with the classy Khan winning by 50-44 and 50-45 twice.